Europe's top officials floated a proposal Thursday for a limited common euro-zone budget fund after 2014 but steered clear of many of the more ambitious plans for deepening integration in the single currency bloc. In a long-awaited report that aims to map out future efforts to bind euro-zone economies more closely, Herman Van Rompuy, the president of the European Council, proposed some important piecemeal steps toward integration but seemed to bow to pressure from Berlin to limit initiatives that would force German taxpayers to stand behind their European counterparts. There was no proposal to adopt a common euro-zone bank-deposit guarantee, and an initiative to create a centralized fund to help countries absorb economic shocks was pushed off until after 2014. Mr. Van Rompuy called for immediate action in setting up a single bank supervisor, to be fully operational by the start of 2014, and said the euro-zone bailout fund should develop the ability to directly recapitalize member-state banks by 2013. The pooling of funds and sharing risk on debt issuance among euro-zone members—as diverse as robust Germany and debt-stricken Greece—is possibly the single most politically controversial issue in the currency bloc. 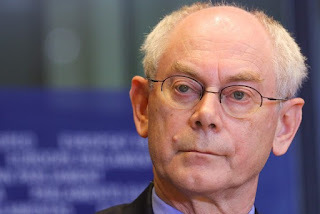 Mr. Van Rompuy's choice of words and sequencing of proposed policies for the future of the currency reflected that.